★★★★★ the battery is removable and replaceable. Some higher priced vacuum do not have this feature. Most important to me is that it's easy to take a part and clean, especially the filter. I can clean it so there will be no replacement costs in the future. ★★★★★ This is a great light weight portable vacuum for the half the price of others on the market. With the many attachments this is really a 5 in 1 vacuum. I can use it as a normal vacuum on hardwood, tile, or carpet. I can use the attachments to clean the stairs and curtains, the weight of this vacuum makes it easy. ★★★★★ Everything about this vacuum is easy to use, from emptying the filter ,changing tools to charging the battery which is removable, leave the vacuum in its place.. It picks up what you want to pick up. The Customer Service was excellent. Thank you. 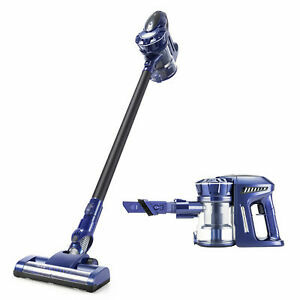 ★★★★★ I got this stick vacuum as I got tired of lugging my heavy vacuum up the steps to my upstairs. It is nice and light, but does a good job cleaning. you can use as stick or handheld for car or other hard to reach places. I also like that there's 2 year warranty so I have peace of mind there. So happy I purchased this.